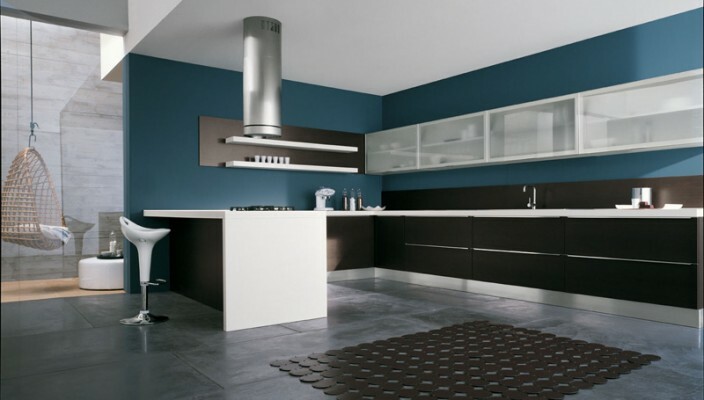 This is a design that makes the kitchen look magnificent with everything systematically placed. The kitchen is not only uncluttered, it makes such a good use of available space that the user is left with ample empty space and yet has a large and imposing kitchen. The two adjacent walls of the kitchen have been used to make an L shaped cabinet and the counter-top. The chimney is centrally placed above the left hand portion of this counter-top. The cabinet is made using dark brown oak veneer with white glossy mica being employed in making the shelves above these cabinets. The walls above the counter-top are painted light blue to compliment and contrast the brown veneer. For natural light inside the kitchen, the left hand wall has a large glass window that starts where the cabinets end on the left side. Tube light fittings are place d on the blue wall on the same brown veneer to create a majestic look.